A Fun and Educational Experience For Children! Church Activities – The “Jesus Loves Me” Train, Church Festivals, Vacation Bible School and Church Preschool Programs. Please donate below for a tax free charitable donation. Canvas Painting, or Door Hanger ... our way of saying Thank You! Ride Trains for Fun of South Carolina is depended on public contributions/donations to make the choo-choo train available to children in South Carolina as well as neighboring states. As a non- profit, we no longer use the words " train fees." However, we do make suggestions as to what it will cost us to put this little train at any event so that children will have an opportunity to participate in our different train activities. We are the only non-profit organization that operates a choo-choo train for children in South Carolina. We are committed to giving back to the communities in South Carolina. We collect canned goods for needy families from children who ride on the train. We give scholarships to children in church preschool programs as well as make the train available to children living at South Carolina Children's Homes. We are working with Richland County School Resource Officers to improve relationships between law enforcement and kindergarteners. Ride Trains for Fun of South Carolina bought and delivered 120 cases of bottled waters to Richland and Lexington Counties during the flood. Please click on the "Donate" button above and make a contribution/donation to Ride Trains for Fun of SC. Suggested fees – One fee for any number of hours. Fundraisers - are usually percentage splits or an agreed upon set fee prior to the event. Festival Rides - are usually $2.00 for a 4 minute ride. All Train Fees are negotiable. Payment expected on day of event or mailed within five working days after event. At least a hundred twenty-five children or at least 5 classes to ride on the Carolina Choo-Choo Train. If it comes necessary for either party involved to cancel the event, either party without cause can cancel the event. Notification must be made as soon as possible but within or up to 48 hours before the scheduled date. Yearly customers have priority. 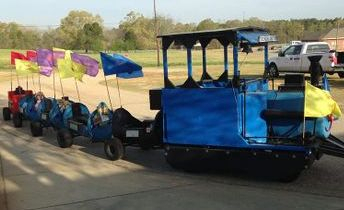 Ride Trains for Fun of S.C. will email yearly customers in January of each year to schedule their yearly event. This little train is always looking for new opportunities to ride children. Scheduled dates may have to be changed or rescheduled or cancelled based on the distance and traveling time between events and weather conditions that may create safety issues in transporting the train on a trailer from one event to another. We are now an official non-profit organization.